Australia is a dry continent and as such all bird-life needs to take advantage of any fresh water that is available. During wet years the bird-life has the incredible adaptability to find fresh water lakes in the middle of the continent. There are many theories on how they can possibly know that a natural rain event has occurred, but the fact that they do know is incredible in itself. Beyond natural events, bird-life that requires fresh water takes advantage of the water that we provide due to human habitation. This may be a simple dripping tap, but one of the biggest attractions in Australia is the Poo Ponds. 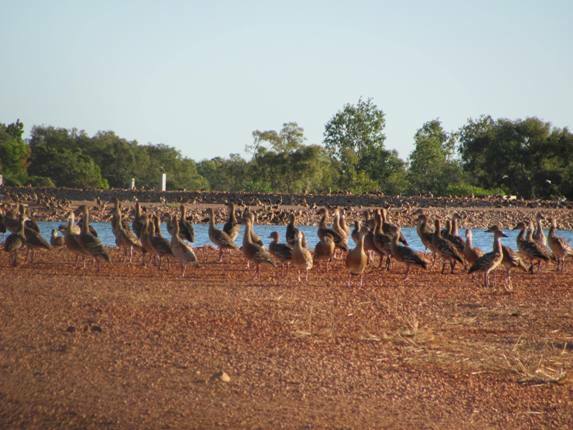 These waste water treatment plants offer the perfect environment to bird-life due to the fact that water is constantly available and is fenced for further protection from feral animals. To a birder these Poo Ponds offer the perfect place to see a large number of species in a relatively small area close to towns. They are not an advertised tourist area, but ask any birder and they will point you in the right direction! Failing that you can try and get a window seat if you are flying into a town-you will soon see where you need to be! We like to look on Google Earth prior to travelling somewhere and get an idea on where we need to be and hopefully the road condition. It is generally good to allow Water Board vehicle access and there is often a track around the fence-line. 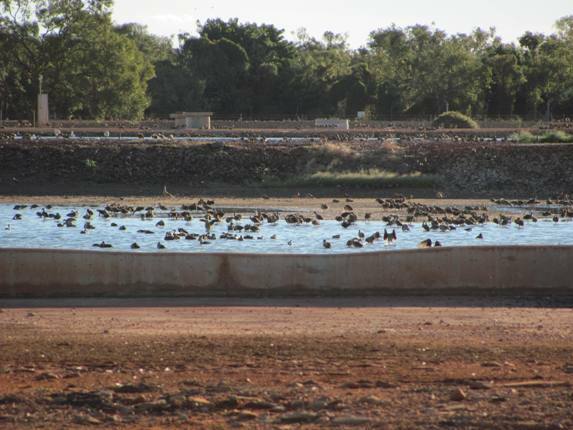 Some Poo Ponds are even designed to attract birders and Alice Springs is well known for it’s bird-life and access. The Werribee Waste Water Treatment Plant to the west of Melbourne has made keys available to a select number of birders, as they recognise the interest. 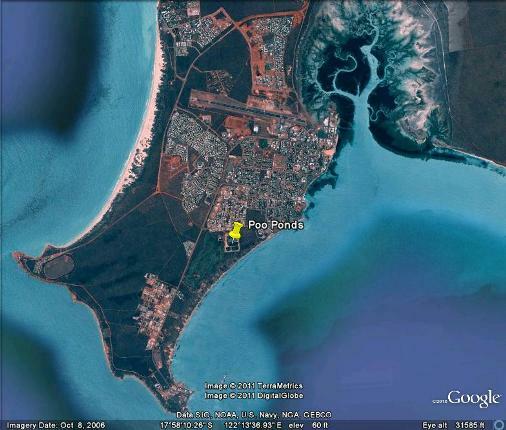 Here are some views from the air-thanks to Google Earth-so you can see how easy it is to find a Poo Pond in Australia! 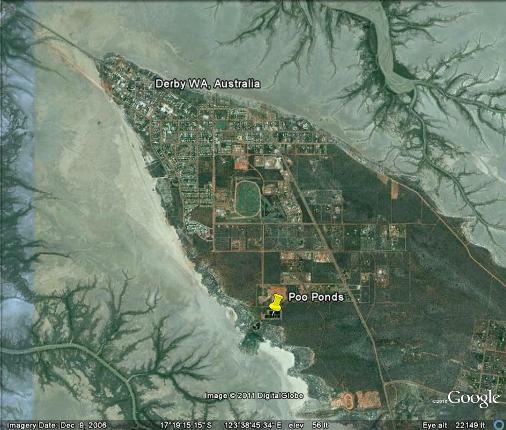 Broome Poo Ponds maintain the golf course greens as well as keep a lot of Plumed Whistling-Ducks happy! Derby Poo Ponds give an alternative to bird-life from all the surrounding mud. 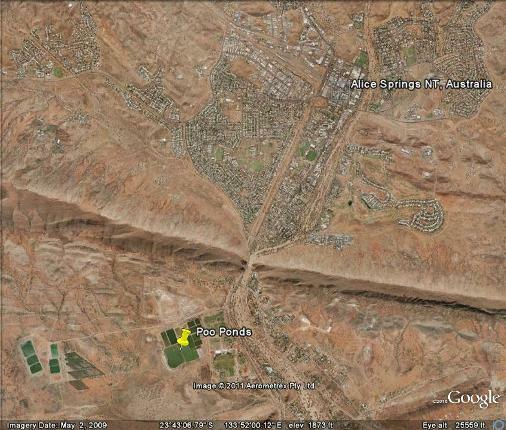 Alice Springs Poo Ponds are incredibly large and easily visible from the air! Throughout the year there are constant changes in the bird-life at the Poo Ponds. I first introduced you to our local Poo Ponds in January and then did a follow up post in April. We have suddenly had a huge increase in the Plumed Whistling-Duck population as the ephemeral lakes dry out and no doubt they have had a good breeding season. They are having a great time at the Poo Ponds and moving onto the Golf Course next door when they want a bit of nice grass to wander around on! Happy ducks in Broome in June! Looking forward to sharing more news on Poo Ponds throughout the year-wherever we may go! bye i will wait for some emails. It is good to know that natural human waste serves for some higher and useful purpose. Hurray for poo ponds!